I’ve written about CSN Stores before, when they let me host a giveaway for a $60 gift card to one of their 200 stores. It’s amazing to me the huge variety of items they offer, everything from a bedroom vanity to Rachael Ray cookware to toys like this adorable kids’ scooter! I always like looking at furniture online, because in our city there just aren’t a lot of options when it comes to furniture shopping. We like clean lines, and in west Texas that style just doesn’t prevail. Take, for instance, bedroom vanities like I mentioned. I think this is something most women would like to have in their rooms – but I’m just not going to lean toward something that’s ornately detailed. 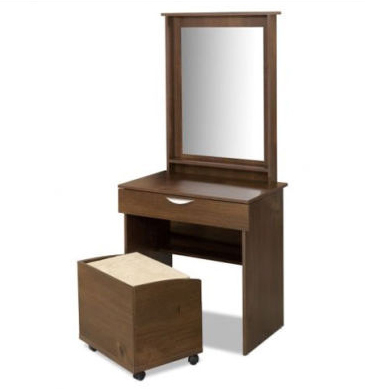 In looking on their site for just 2 minutes, I found a vanity that suits my taste perfectly. CSN Stores has given me the opportunity to do a product review, and I had a lot of fun deciding what to review. I did look at furniture first, but then decided on something else… any guesses? I’ll give you two hints – it’s something from their cookware.com store, and it’s something perfect for the summer. Check back soon to see if your guess is right! Note: CSN Stores is providing me with a product to review in an upcoming post, but the opinions provided here remain honest and are my own. I think it is either the Cuisinart Soft Serve Ice Cream Maker or a Snow Cone Maker. I have a traditional ice cream maker, but I’m loving the Soft Serve Ice Cream Maker. My husband does not like hard ice cream, so I end up nuking his bowl for a few seconds.